know thy machine blog hop! It's being put on by Shruti at 13 woodhouse road, so be sure to check out all the other stops! She asked all of us a series of questions about our machines. I thought this would be a fun time to share some peeks into where I sew! 1. What machines do you have? I have two sewing machines. a Brother XL-3750 and a Brother LS 2125-i . I started out with a light green Kenmore my Nana gave to me when I graduated high school, and a Singer Fashion Mate that was my mom's. I also have Nana's old serger, but I haven't sat down and figured it all out yet. 2. When and where did you buy it? What were the reasons for selecting these particular models? What was its approximate cost? 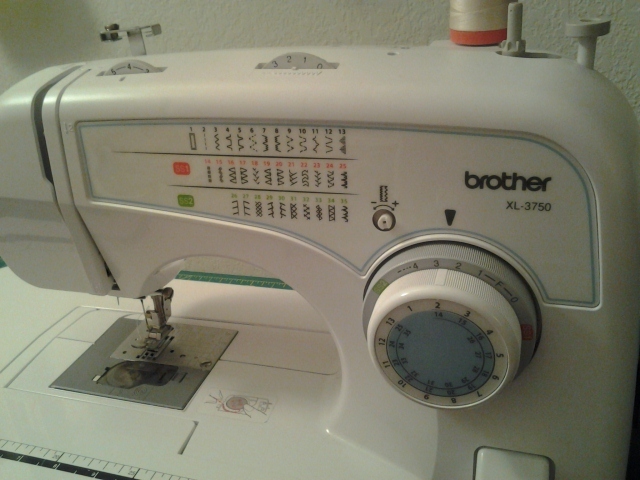 The first machine, the Brother LS 2125-i, was a craigslist find, and I paid $40 for the fairly new machine. A KU student was headed overseas, and said shipping it was more than buying a new one when she arrived. I wanted a shiny new machine, and thought it was a great deal! Until I started having tension issues. Having it serviced was more $$ than it originally cost me, so for now it sits in my closet. It may be something I was doing wrong, I need to get the thing out and take another look. Then Target had the Brother XL-3750 on sale for $199 at Christmas two years ago, and it came with a walking foot and FMQ foot, so I was sure it would cover all my needs. My husband bought it for me! 3. What do you like about your machine? I like it, I don't LOVE it and I would gladly accept a new machine from Bernina or Janome! But it's capable and gets the job done. I haven't named it, we're not all that close. Occasionally I call him "bro". Sometimes I scold him when he's not cooperating. Have you made a cover for it? Nope, I don't cover my machine. I sew any chance I get, which may mean 5 minutes in the morning once I get the kids on the bus, and so I always have it ready to go. I keep blocks for several projects in rotation, allowing me to always have leaders and enders, which saves thread and multi tasks. win win! 4. Does your machine give you any problems? Could you tell us a few? This is my second brother, and I've had tension issues with both. mainly things like having loops on the top of the fabric, but changing the tension settings makes no difference. I usually just clean my machine really well, and cross my fingers. I've noticed he doesn't like it if I overfill my bobbin. And I was trying to make a hooded towel for a baby gift 2 weeks ago, and my machine wasn't enjoying sewing through such thick fabrics. I'm also unable to FMQ if I cover the feed dogs with the included darning plate. It's a loopy mess underneath if I do that. But if I leave them up, it works pretty well. I just have to master the art of moving the fabric around without being jerky or crossing my lines. 5. What do you sew on it mainly? 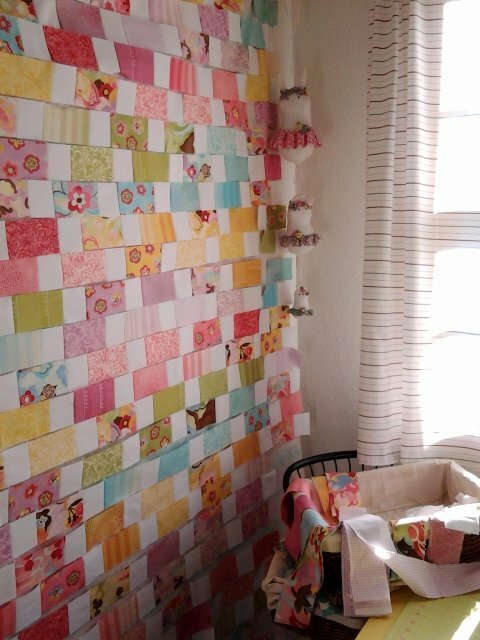 I make tons of quilt blocks. I belong to several bees, and always have blocks I'm working on. I don't do a lot of actual quilting on the machine, just small things like pillows and baby quilts. For larger quilts, I piece the tops and then send them off to be quilted. I occasionally make clothes for my kids, and small projects like quilted notebooks, aprons, totes and the like. Last summer I sewed my first swimsuit, for my daughter! How much time do you spend sewing on it? I sew whenever I can - even if I just get a minute or two, I chain piece some blocks. If I go a day or two without sewing anything, I start to feel twitchy. Even if I'm just mending, it feels good to sew something. What are the features of the machine that help you improve your work? I like my extended table, and the walking foot is a bonus. 6. What advice would you give others when deciding about which machine to buy? I believe for a beginning stitcher or quilter, or someone with little money to spare for a hobby, the Brother XL-3750 machine gives a lot of features. It's a cheap machine, but I've used it almost daily for going on three years with no real problems, and I feel like I've gotten my money's worth out of the little guy. It comes with specialty feet, and lots of decorative stitches. I have never had it serviced. I keep canned air to blow out the dust and that's the extent of maintenance for me. There's also a great post about this subject at stitched in color. 7. Will you share with us a special memory associated with your machine? The only one I can think of is when I was sewing at the dining room table, and my then three year old managed to pull the machine off the table by the cord. Luckily no kids or machines were harmed! But it made me realize I needed a safer place to set up my sewing stuff. For a short time I was sewing in our laundry room, standing up, with the machine on the washer! I actually liked sewing while standing, less strain on my back. I finally settled on a space in our upstairs, a random nook with a window, that wasn't working for anything else. It's small, and I'm messy, but it actually functions pretty well. I'm about to share some embarrassing photos of my chaos, because although I love those tours of amazing sewing rooms, this is what mine always looks like. Plus, this might shame me into finally getting organized. Someday. The cutting table, iron, and design wall are all so close together, it actually makes an efficient work area. My machine sits next to that, and cabinets from yard sales hold my fabrics and books. Plastic drawers hold charms and scraps. Baskets have WIPs and UFOs and random junk. My husband plans to run electrical outlets and lights for me, the nook has none right now and I use extension cords and outlet strips. I'd love to put in some cabinets to replace the plastic stuff. 8. If you had unlimited resources in the world, which machine would you choose to buy and why? My dream machine would probably be a Bernina 830. You know, if I had an extra $13000 in my pocket. Or if someone wanted to buy me one, oh, maybe for a Christmas present?! haha! Dream big, right? Thanks so much Shruti for having me on your blog hop! now, i'm off to raid my kids legos and try to make my own lego sewing machine! isn't it so cute! don't forget to visit 13 woodhouse road to answer a question to enter her giveaway! I have and still use from time to time my Kenmore sewing machine which my husband bought for me the first year we where married so it is 44 years old. I used to sew all my daughters clothes as well as shirts and suits for my husband and have made 1 quilt; no make that 2 quilts; a patch quilt and then a Memory quilt for my parents 50th anniversary, but don't do much sewing anymore. Also have a vintage machine of which was given to me some years back but have never used it.